Imagine standing in front of a book shelf full of cookbooks…your cookbooks. Some of them are old favorites with worn pages and red wine stains. Others might have been opened once, flipped through and then discarded because you had no idea where to find half the ingredients. But all of them are getting tired and boring. You need something new to spark the creative juices and get excited about adventurous cooking. Also imagine, you randomly have $600 burning a hole in your pocket and Amazon prime for free two day shipping. That’s when inspiration strikes and you realize there’s nothing you’d rather do than spend $600 on a bunch of intimidating cookbooks that will take you months to work up the confidence to try and of the hundreds of recipes only to realize your final result will look 1/10th as good and if you are lucky will be barely edible. If you are currently finding yourself in this situation, have no fear…I’m here to help. On today’s over crowded cookbook market are two serials that will easily set you back $600 and simultaneously make you look like a serious chef to your friends and make you feel horribly inadequate. These two tomes are Nathan Myhrvold and Ferran Adria, two modernist cooking titans with very different backgrounds and styles. 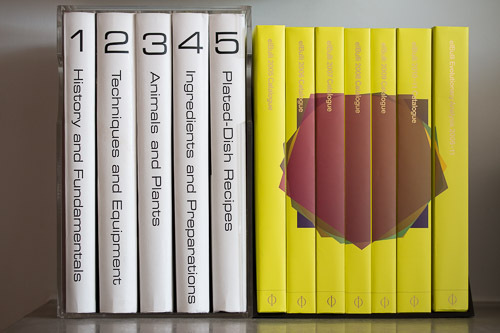 The two opuses in question are Myhrvold’s Modernist Cuisine and Modernist Cuisine at Home and Ferran Adria’s elBulli 2005 – 2011; two monstrous collections weighing in at a combined 100 pounds. Although both are sure to be recognized as classics for future generations of aspiring chefs, the two couldn’t be more different. Before spending $600 on anything, one should understand what exactly it is they are getting, which requires filtering through the amazon reviews written by the firms’ advertising agencies and talking with someone who’s actually spent time with both volumes. I’ll go through several criteria I find meaningful and give you my impression of each book. The new frontier of modernist cooking and molecular gastronomy features many new ingredients, techniques, and equipment that may be alien to many home cooks. Modernist Cuisine: MC spends a significant amount of time teaching readers the basics. It starts off with an entire volume devoted only to the fundamentals of cooking such as food safety, what happens when meat cooks, and how temperature and time work. Later volumes devote pages to charts on colloids and other new ingredients and detailed explanations on how equipment functions. For someone with an interest in how things work, Mhyrvold’s background as a scientist at IBM and his fascination for the science of cooking might appeal to you. For those who just want to cook, you might be disappointed in the amount of space dedicated to explanation and education. elBulli: EB devotes an entire volume to understanding the evolution of cooking and creativity at the restaurant, which does include descriptions of new ingredients and techniques, but these are more related to how they have been used in the restaurant rather than the scientific explanation of their functionality. New techniques, such as freeze drying, are also mentioned, but given very little space and no explanation as to why this technique is necessary and better than others. With recipes that go on for pages and steps that go on for days, both books assume the reader has nothing better to do than spend hours in the kitchen. Modernist Cuisine has developed a revolutionary recipe system that is very clear and easy to use. Their reliance on weight rather than volume, is just catching on the American kitchen, but is clearly the better method. Where recipes might be short and concise, the other volumes feature more information on how to perfect the technique, making most recipes achievable for a diligent cook. 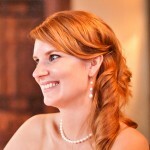 I’ve personally made dozens of the recipes and am grateful there are simpler and more complex recipes to choose from. elBulli clearly has earned its title of best restaurant in the world for a reason. The recipes are very long and complex as they sometimes are in MC, but additional explanations and tips are very lacking, leaving readers pouring over the one line instruction and searching for additional help and meaning. After going through all six volumes of recipes, I found myself hopefully optimistic that I’d be able to attempt a handful without fear of total failure. At the end of the day, we eat with our eyes. Cookbooks that can show how the food should look entice us to try out what might be a challenging recipe. It’s here that both books do a stupendous job. Modernist Cuisine is well known for its photography of both the food and the equipment and techniques. The process of how meat goes from raw to over cooked is documented with stunning photography blending several images to create one uniform steak that is raw on one end and over done on the other. Cooking equipment was literally sawed in half and photographed with food inside to show you how a deep fryer works or how vegetables cook when being boiled. No expense was spared in the production of this book and it shows. My one complaint would be that not every recipe has a picture associated with it. eBulli also has spent considerable time and energy on the visual representation of the food and how it appears in the book. Every recipe has a half or full page photo of the final product, greatly helping in the art of presentation. The photos are in the front of the book, while the recipes are in the back half, which is not ideal, but does make for a beautiful photography ensemble. Both books are masterpieces and their authors should be proud of their achievements and how they come to life in these compositions. Modernist Cuisine and its younger sibling Modernist Cuisine at home are far more useful and educational for the home cook whether they are just starting out or are more advanced. Their detailed descriptions of the techniques and ingredients as well as the science behind them give their readers confidence to not only attempt the recipes within, but also to venture out and try to create their own meals based on a newfound knowledge. elBulli is a needed chronicle of one of the world’s best ever chefs, but it is not a must have for the at home cook. Many of the recipes are just too daunting and require too much out of reach equipment and ingredients. So if you are looking to learn more about Modernist Cooking and ease into some of the more challenging techniques, I’d recommend purchasing Modernist Cuisine. If you already have begun mastering some of the more challenging techniques in Modernist Cuisine, such as spherification and sous vide, and are looking for the next challenge, then I’d recommend eBulli 2005 – 2011.